Kris has been married to his wife Jacque since 2010, and together they are raising a small family in southwestern Shawnee. Kris, Jacque, and their daughter Makyla, are proud to call the Monticello neighborhood of Shawnee their home. Kris and Jacque started dating in 2007. Since they were married, they have lived in Kansas, Virginia, and Texas at various times. In 2012, they bought their first home together. 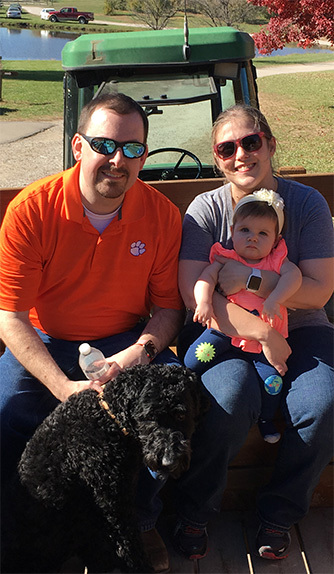 Kris and Jacque also have a pet goldendoodle dog, Willa, who has been with them since 2013. In 2018, Kris and Jacque grew their family by one, welcoming their daughter Makyla. They all enjoy exploring the world together. Kris and Jacque have traveled far and wide, and Makyla is already a seasoned traveler at her young age.